3D printing and CNC machining are the two most commonly used methods when it comes to prototyping and low-volume production. However, since both offer two very different approaches to manufacturing — one being additive and the other subtractive — identifying the right manufacturing method for your application is crucial for streamlining product development, achieving greater efficiency and, ultimately, higher-quality parts. In this tutorial, we’ll look at the differences between 3D printing and CNC machining and share a few tips on how to pick the right method. When looking to produce functional prototypes and/or end parts, 3D printing and Computer Numerical Control (CNC) machining can offer a range of benefits. However, while both rely on CAD data and use a variety of materials, the similarities end here. 3D printing (or additive manufacturing) covers a range of technologies that work by depositing material layer-by-layer on the build platform of a 3D printer to create a part. No tooling is required during the process and complex parts can be created without affecting production time or cost. CNC machining, in contrast, is a subtractive technology. This means that instead of adding layers of material successively, the process begins with a solid block of material; a tool is then used to chip and cut away at the block along a computer designated path to shape it into the desired object. 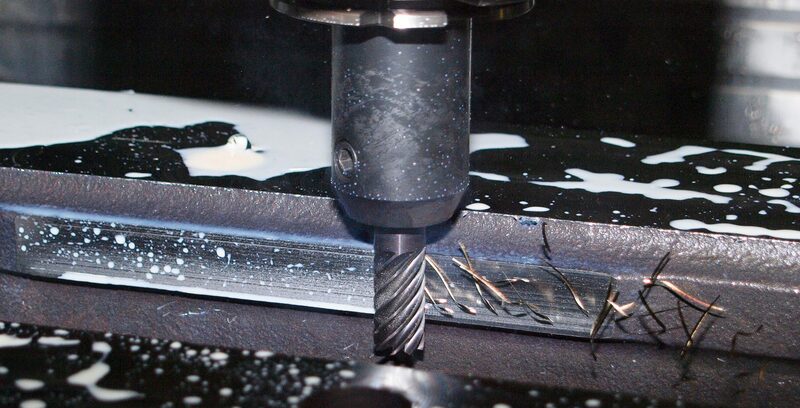 As CNC machining involves a range of complex machinery, the process requires a skilled machinist to adjust the tools, define the cutting path and reposition a part to achieve the right shape. 3D printing, in contrast, is an automated process, and therefore far less labour intensive. Of course, the file needs to be prepared for printing (including converting to STL, defining the optimal orientation), but the overall process shouldn’t take longer than 30 minutes. Once the file is prepared and the printer set up, no intervention is required until the part is completed. For both processes, various factors can affect production times. The manufacturing time for CNC machining depends on design characteristics (size, kind of material, wall thickness etc.) and the number of features (e.g. size and depth of pockets and holes). For example, smaller features will require slower cutting speeds, which adds time. For 3D printing, factors include the volume of the material for the part and its height. Unsurprisingly, the more material needed, the longer the printing process. Some features also require support structures, which can add between 5% and 15% more time to the printing process. One of the added benefits of 3D printing is the ability to create complex parts cost-effectively – which is one of the reasons why the technology is increasingly used for metal lightweighting applications. With CNC it’s quite the opposite: the more intricate the part, the slower the machining process and the greater the effort involved, leading to higher costs. There are other factors that can affect the cost of production, from material prices (CNC and 3D printing) to the cost of repairing or changing machinery (CNC). Since CNC works by cutting a part out of a solid block of material, the process creates structurally strong and dimensionally accurate parts. In contrast, the successive, layer by layer approach of additive manufacturing means that the technology typically produces weaker parts than CNC. Metal 3D printing, can be particularly problematic, with issues like porosity leading to uneven part strength. CNC can produce a lot of excess waste, as it removes material from the block that often cannot be recycled afterwards. Compared to CNC, 3D printing produces much less waste (from 1 to 3 %), with some technologies such as Binder Jetting and SLS enabling any leftover material to be reused. Since CNC machining works with blocks of material, it is capable of manufacturing large-scale parts relatively easily. In contrast, 3D printing is more suited to smaller parts and components, although large-scale AM systems are increasingly entering the market. Parts produced with CNC have a great surface finish and typically do not require any obligatory post-processing. 3D printed parts, however, will almost always require some kind of post-processing, depending on the chosen technique (removal of support structures, depowdering, cleaning, polishing etc.). Also, depending on the part, support removal can take as little as 5 minutes to as much as a few hours for a batch of parts. 1. What is your production volume? The economics of choosing either 3D printing or machining can often come down to the volume of production in that particular use case, and the number of parts you need to produce. It’s prudent to opt for 3D printing when a small batch of parts is needed (less than 100 parts) and consider CNC machining when you target medium run production (less than 1000 parts). For small volumes of highly complex bespoke parts, it is cheaper and faster to 3D print them rather than use machining. From the expenses, associated with the equipment itself to paying a skilled operator, the costs for CNC machining are high. 2. Do you need multiple, quick design iterations? 3D printing is the technology of choice for prototyping applications where fast design iterations are needed. With additive technologies, it only takes the tweak in the design to create another prototype. With machining, design modifications are far more complex, requiring multiple, often labour-intensive, setups and tool changes. 3. How important is geometrical complexity? When it comes to the geometrical complexity, 3D printing reigns supreme. With the technology, complex geometries can be created that no other manufacturing method can reproduce. And while support structures may be necessary for certain technologies like Stereolithography (SLA), others, like SLS do not require them at all. In addition to lightweight structures, 3D printing is ideal for producing assemblies as a single component and parts that require complex internal features, like conformal cooling channels for injection moulds. 4. Which materials do you need? Since CNC machining is the more established technology, there is a greater range of compatible materials, including metals (including aluminium, stainless steel and alloys), plastics (including ABS, nylon, polycarbonate, acrylic and PEEK) and wood. However, when a material that cannot be easily machined is required (such as metal superalloys, titanium or flexible TPU), then 3D printing is the wiser option. 3D printing can also create parts from thermoplastics (including ABS, PLA, ULTEM, PEEK and nylon), resins, ceramics and metals. On the surface, CNC machining and 3D printing may seem like mutually exclusive technologies: indeed, one subtracts material, while the other adds it. However, in many cases, both techniques can work extremely well together – which is why the number of hybrid machines available on the market is growing. While CNC has the edge when it comes to achieving high dimensional accuracy, 3D printing can reduce production costs for low volume production, provides greater design freedom and offers faster turnaround times. By combining the benefits of both methods, parts with complex shapes can be 3D printed and then machined for tighter tolerances and smoother surface. Ultimately, choosing the right technology for your needs will depend on a range of factors, including the material needed, part complexity, production volume, budget, and timeline. However, sometimes it might not be about picking just one – taking a hybrid approach can help reduce manufacturing time and costs while enabling a more streamlined production process.